In our opinion, it would be difficult to find a more rugged off-road SUV than the 2018 Toyota 4Runner in Edmonton AB. The 4Runner has been blazing trails since 1984, but has gone through enough updates and changes that it remains one of the top options in the off-road SUV class. It entered its current generation back in 2009, but it undergoes enough upgrades every couple of years that it is just as relevant today as it was then. With a sporty, aggressive appearance from bumper to bumper, the 4Runner is every bit as stylish as it is utilitarian. Its heavy-duty, body-on-frame construction is complemented by its alloy wheels, roof rails, running boards and other exterior design cues. On the inside, it doesn’t sacrifice style or comfort for its versatile utility either. With oversized, comfortable seats in every row – whether you have two or three – you and up to 5 or 7 passengers will enjoy every drive, be it to the grocery store or across a previously undiscovered trail. Another thing that 4Runner doesn’t sacrifice is technology. Technological features like Hill-Start Assist Control help with your off-road adventures, while other features like the Smart Key System, keyless entry, cruise control, touchscreen audio and the backup camera enhance your everyday driving. While safety might not be at the front of your mind when shopping for a vehicle like this, it’s possibly even more important. 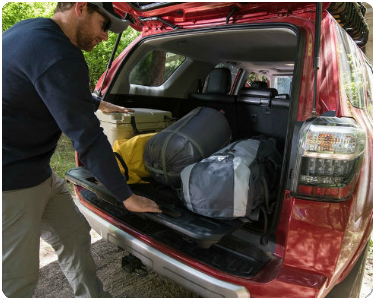 The 4Runner’s 8 airbags and energy-absorbing body structure will help keep you safe even in the unfortunate event that something were to go wrong on the trail. Performance, whether on or off of the road, is impressive in the 2018 4Runner. Powered by a 4.0L V6 engine, the 4Runner can dole out 270 horsepower alongside 278 pound-feet of torque while trailering 5,000 lbs. You can also enhance performance and other off-road abilities by opting for the TRD Off-Road or TRD Pro packages, adding things like Kinetic Suspension System, multi-terrain ABS and other features. If you think you might be interested in this trailblazing beast, be sure to get in touch with us about the 2018 Toyota 4Runner at your earliest convenience!